A smell can do it. So can am image. Or sometimes a distant memory will seemingly appear out of nowhere. That's what happened today when a memory from 30 years ago instantly popped in my head as if it was yesterday. The flame came from a simple candle sitting on a small bedside table. I wasn't sure how it fell over but it didn't take long for the flame to spread. I stood there watching nervously. First I was just curious and then anxious, but when the bedroom became fully engulfed it's the penetrating heat that I remember most. The fire was set purposefully by the Santa Barbara Fire Department in an old warehouse that was tagged for demolition. The makeshift bedroom was erected as part of a training exercise. I was standing across the warehouse observing the fire along. I was working for my college daily newspaper as a photographer and what stared as nerves for my safety evolved into nerves that I wouldn't get my shot. The warehouse was horribly dark and the only light in the room was coming from the fire and a door to the outside world. Despite the intensity of the situation, the images I was seeing through my lens was totally unusable. I did what photographers do. I snapped the shudder and advanced the film. I hoped that I had enough light, but was never positive in situations like this. I snapped again. Another wasted image. 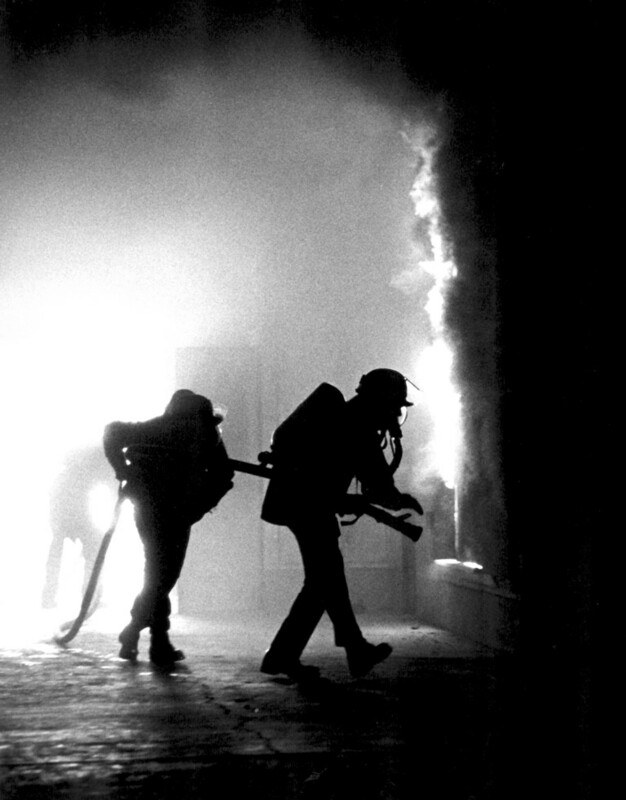 The fire fighters in training entered the warehouse and steadily made their way toward the fire. As they closed in on the bedroom the fire suddenly burst through the wall and backlit the fire fighters for an instant. I snapped. Advanced the film. The fourth and fifth frames proved useless as well. As I walked back into the paper, an editor asked me if I got a good shot. Good shot? I wasn't sure I had anything. I made a b-line for the dark room and in route I saw the layout for the front page with a large hole that was my responsibility to fill. If I didn't have a shot it was still my responsibility to fill the hole. This was the biggest stress of my college years. After washing the film, I held the wet negatives up to the light and slowly confirmed my worst fears. No light, little action and largely clear negatives. And then I got to the third frame. I was pretty good at looking at negatives and discerning what I had, but this time it was hard to tell. It was not a perfect negative and took me some time to print but the result was one of the most memorable images I've ever recorded. UCSB's Daily Nexus circa 1980.